It is such a funny phenomenon that people, though they might speak English, don’t all speak the same language. Having grown up in America and now living in London after seven years in Ireland, I seriously think that we are speaking completely different languages full stop! Not even discussing the obvious, pronunciation, we actually have different words for the same thing. It can be very confusing. I’m not the only one who deals with this, obviously, as there are numerous articles written about it. A wardrobe or closet, a press or cupboard, are all useful words to describe similar household items. However they have completely different meanings depending on which country you reside. I discovered the hard way when I was at the Ballymaloe Cookery School that a boot isn’t a boot as I knew it. In Ireland, it is the trunk of a car and what I call a boot is actually a wellie (short for wellington, or rain boot). Let’s not even talk about kitchen essentials, such as a stove is a cooker, Saran Wrap is Cling film, and aluminum foil is the same, but pronounced a-LU-MIN-i-um foil. After getting teased mercilessly by the other chefs, I just called it foil! There was a recent Facebook post by an American man about differences he noticed being in the U.K. and the U.S. It was so funny it went viral. He describes how in this part of the world, chips are what french fries are in America, and chips in America are called crisps over here. I could relate to some of the things he talked about. For one, I cannot for the life of me find napkins. A thorough search through the largest Tesco in the world, and I still came up short. When I asked the store manager he suggested I get kitchen paper (another name for paper towels). But I like a nice white paper napkin (also known as a serviette). It occurred to me that when I’ve dined in homes of British people, napkins were noticeable absent. Perhaps they are so proper they don’t need them, but I am known to spill a bit of food from time to time. I recently went on a Food Tour and luckily there were napkins in all the restaurants. Maybe they are used to messy American tourists? I also find it fascinating what kinds of things are sold in the supermarkets. I actually analyze what products dominate the shelves to determine what is most popular in a particular country. I’ve been lucky enough to travel to some great places and no joke, I take photos in all the different grocery stores. In Italy for instance, no surprise, the pasta aisle seems to go on for eternity. Along with olive oil. Like thousands of different varieties, flavors and bottle sizes of the precious oil. Gauging by my arm chair anthropological theory, the English love their sweets and snacks. American’s love their breakfast cereal. The Irish, you guessed it, love their potatoes. And that love has parlayed into a “Tayto” amusement park! In fact the government recently spent 5.5 million euro on a marketing campaign to give a little love to the old starchy side dish fondly referred to as a spud! This also coincided with #NationalPotato Day funny enough! Until I moved to Ireland I thought there were only a couple varieties. You know, the ones used for making baked potatoes and ones to mash. 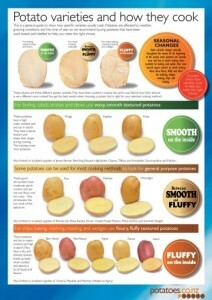 But in Ireland, it really is a plethora of potatoes in the shops! The whole time I taught cookery classes in Dublin, I never demonstrated how to make potato dishes. I would often have a bit of mashed potato or a potato gratin, but only as a side dish for a lovely chicken or fish dinner I had demoed. I felt that to teach them how to make a creamy mash would be akin to preaching to the choir. As well, I think I have a subconscious aversion because I was nervous that I might add an ‘e’ to potato when typing up my recipes. I didn’t want to look like a female version of former Vice President Dan Quayle! I shared on here before about how my daughter has given me “hand me ups” in the way of clothing as well as recipes. She shyed away from cooking growing up but when she got married she really got into it. And for a time she achieved so much confidence in the kitchen that she had her own cooking blog. Now that she is a busy mom of two little girls, she had to put it on the back burner (pun intended). But I still look at her blog from time to time as she really has a knack for it. Her plating and photography skills are awesome! One of her posts was actually for mashed potatoes. I loved her commentary about how she was so nervous as a new cook that she had to either call me or look on the internet for instructions on basics such as how to mash potatoes. And though now she can whip these up in her sleep, it is good to know some people have to start somewhere. 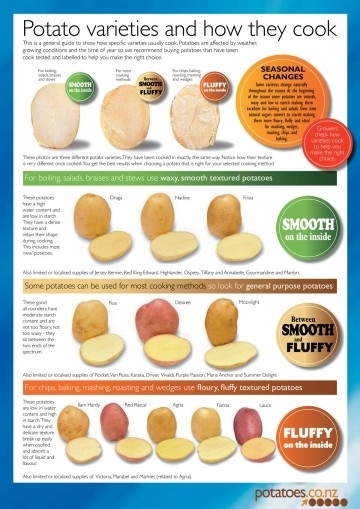 So if you are one of those, or else maybe you’re someone who wants a different kind of mash potato, than here is a recipe for you. I love them because the skins are actually left intact. Less time prepping, yeah, no peeling! But what is left is more nutrition (the skins are loaded with vitamins). As well these are meant to be a bit lumpy, so you aren’t stressed about getting them ultra smooth and creamy. 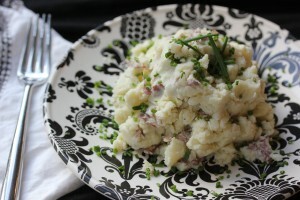 I think they should be called Smashed Potatoes! As in Po-TAY-toes! Unless you are from a part of the world that refer to them as Po-TAH-toes! Place potatoes in a saucepan adding enough water to cover them by 1 inch. Bring to a boil; lower heat and simmer until potatoes are soft, about 15 minutes. Drain potatoes in a colander and return them to the saucepan. Coarsely mash potatoes, gradually adding heavy cream and butter. Consistency should be a little lumpy. Add salt and pepper to taste. Okay, granted these do have cream and butter. But if you use Kerrygold butter than you’re good to go! Haha! Then again, I’ve already divulged our love affair! Seriously though, you can always use a chicken or veg stock in place of the cream to make this recipe less naughty. 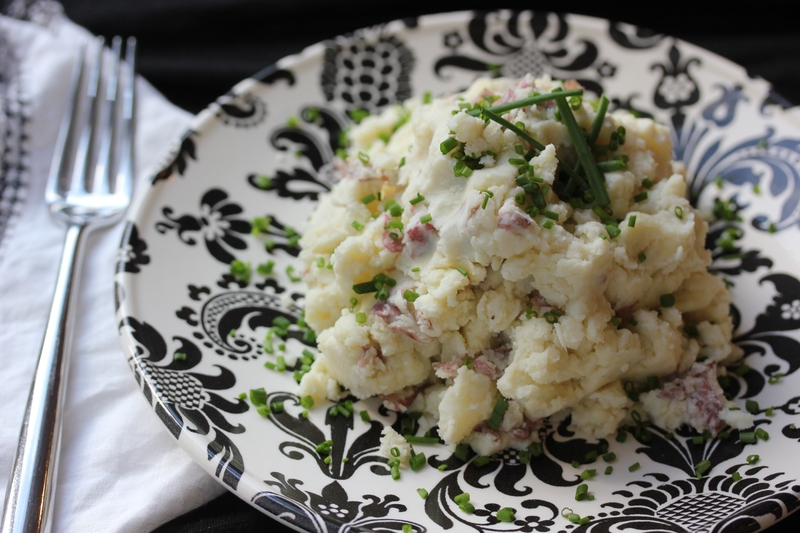 I can almost guarantee you will make this your go-to recipe when you want to get in touch with your inner Potato Loving Paddy! Next > Foodie Fieldtrip Fri-yay!